Zero Balancing post - Hunt alley acupuncture & Chinese herbal medicine Paw Paw Jam — Hunt Valley Acupuncture & Chinese Herbal Medicine, Inc.
Late summer is a lot about bounty, processing and transformation. Pawpaw foraging adventure took five hours between driving and walking with our buckets to the pawpaw forest. It was a rainy humid day that felt both hot and a little breezy at the same time. I love forest bathing, I consider that to be a natural therapy, breathing fresh air, listening to the sounds of the forest and exploring the changes and what the flora and fauna are up to. iPhone tucked away and on silence except for occasional picture taking. My friend and I ventured into the forest, walked about two miles until we spotted the first cluster of pawpaw trees. Pawpaw trees are indigenous to North America, they have big leaves, thin trunks and look fragile. It seems that they love to live in the company of each other more than other plants. As a matter of fact, if you decide to grow them in your garden then you’d better have at least three of them for cross pollination. They bare a fruit that has a flesh that resembles custard, and it tastes like a cross between bananas, mangos, and pineapples!! The fruit has medicinal value, mostly from what I read about it is that research reveals that the fruit contains properties that can rid of cancer cells. 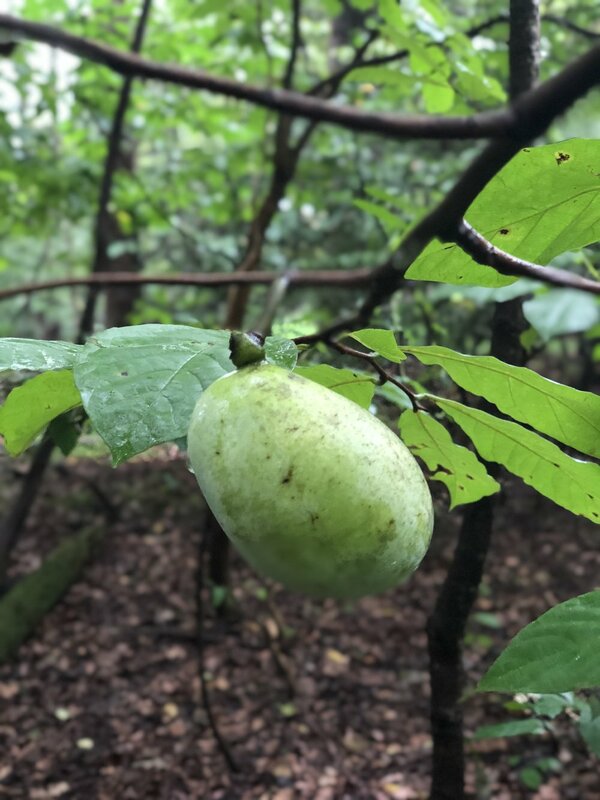 Pawpaw fruit is fragile and doesn’t travel well, which is the reason why it is not very well known even in the areas where it grows. There is a small window to harvest the fruit before it turns to mush and the critters start munching on it. The flesh of the fruit varied in flavor and color depending on the tree. I collected enough fruit to make jam, cheesecake, and to share with friends and family. I wanted to bring the Pawpaws to my friend Zanti and make jam with her because it’s more fun like that. This process took another few hours. Add all the ingredients together and simmer gently until the jam thickens. Pour in sterilized jars and seal with paraffin. This yielded six 4 oz jars.